In Tom Hank’s 2000 drama Cast Away we see the allegory of a well-adjusted business man thrown into the throngs of seclusion on a desert island. By the way of washed up luggage and a lot of MacGyver style tool making he manages to break from his tropical prison. But what if all Hanks had was a dead body? 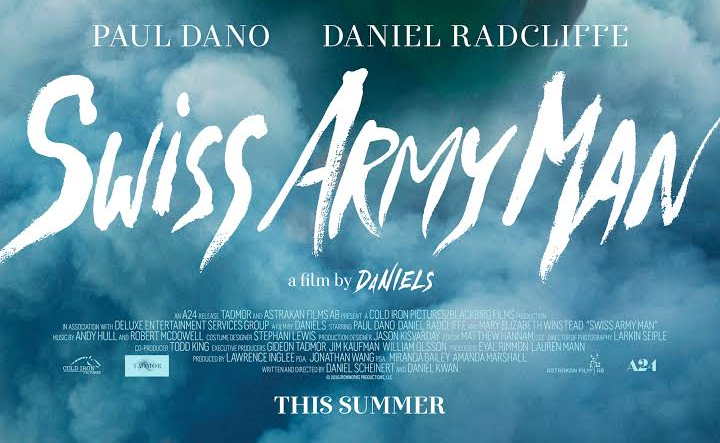 Swiss Army Man, starring Paul Dano and Daniel Radcliffe, faces this motif of the lost everyman rebuilding his way into society in an almost therapeutic sense rather than out of necessity or survival. Dano plays a loner who, in the act of ending himself by hanging, finds a dead Radcliffe that changes his fate entirely. With the magical powers of gastric juices, a stomach for a Camelback, and a projectile launching mouth, Dano’s character blows past the ideals of the normal survivalist film that eventually leads to the purpose of why we want to be in civilization in the first place. Radcliffe’s childlike performance of becoming a person again under the tutelage of Dano’s purposeless and shy teachings lends to an endearing comparison. Plus, it’s a whole lot of fun. The chemistry of two mainstream actors doing their own personal low budget film, including doing an entire soundtrack by themselves, lends a personal touch that even indie films can forget to add. The film tackles the tricky subject matter of how much we really matter and the introspective nature of the film leaves the answer up to the audience to decide. With astounding performances and a soundtrack sung by both main actors, Swiss Army Man is a different kind of buddy comedy event that has a whole lotta heart, even if its title character doesn’t have a pulse. Having an incredibly limited release earlier this July, expect to see a multimedia release this fall.